Francis Albert "Frank" Sinatra was an American popular singer and Academy Award-winning actor. Beginning his musical career in the swing era with Harry James and Tommy Dorsey, Sinatra became a solo artist with great success in the early to mid-1940s, being the idol of the "bobby soxers". His professional career had stalled by the 1950s, but it was reborn in 1954 after he won the Academy Award for Best Supporting Actor. He signed with Capitol Records and released several critically lauded albums (such as In the Wee Small Hours, Songs for Swingin' Lovers, Come Fly with Me, Only the Lonely and Nice 'n' Easy). Sinatra left Capitol to found his own record label, Reprise Records (finding success with albums such as Ring-A-Ding-Ding, Sinatra at the Francis Albert "Frank" Sinatra was an American popular singer and Academy Award-winning actor. Beginning his musical career in the swing era with Harry James and Tommy Dorsey, Sinatra became a solo artist with great success in the early to mid-1940s, being the idol of the "bobby soxers". His professional career had stalled by the 1950s, but it was reborn in 1954 after he won the Academy Award for Best Supporting Actor. He signed with Capitol Records and released several critically lauded albums (such as In the Wee Small Hours, Songs for Swingin' Lovers, Come Fly with Me, Only the Lonely and Nice 'n' Easy). Sinatra left Capitol to found his own record label, Reprise Records (finding success with albums such as Ring-A-Ding-Ding, Sinatra at the Sands and Francis Albert Sinatra & Antonio Carlos Jobim), toured internationally, and fraternized with the Rat Pack and President John F. Kennedy in the early 1960s. Sinatra turned 50 in 1965, recorded the retrospective September of My Years, and scored hits with "Strangers in the Night" and "My Way". Sinatra attempted to weather the changing tastes in popular music, but with dwindling album sales and after appearing in several poorly received films, he retired in 1971. Coming out of retirement in 1973, he recorded several albums, scoring a hit with "(Theme From) New York, New York" in 1980, and toured both within the United States and internationally until a few years before his death in 1998. 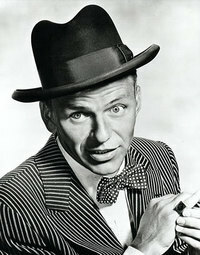 "Sinatra was...the first modern pop superstar...Following his idol Bing Crosby, who had pioneered the use of the microphone, Sinatra transformed popular singing by infusing lyrics with a personal, intimate point of view that conveyed a steady current of eroticism...Almost singlehandedly, he helped lead a revival of vocalized swing music that took American pop to a new level of musical sophistication...his 1950's recordings...were instrumental in establishing a canon of American pop song literature."